Back In March I had the opportunity to spend some time in NYC and hang with some friends. It was three days of wine tasting in foodie heaven and I wanted to post about the wines and the food, because some of it was just spectacular! It all started on a Monday night after the very average City Winery event, I made my way to SB and DF’s home and continued the wine tasting there. Sadly, I seemed to have misplaced my notes for two of the wines; namely the 2007 Ella Valley Cabernet Sauvignon, Vineyard Choice and the 2004 Ella Valley RR, Vineyard’s Choice. The RR, if I remember correctly was all over the place and on the other side already in puppy heaven. The 2007 VC Cab was rocking, with rich layers and lovely barnyard, but for some reason I do not have the notes, no idea why! Of what I do remember the 2007 Cab VC was very old world in style with barnyard and lovely dirt and mushroom notes, with blackberry and plum, lovely! The 2007 Carmel Kayoumi Shiraz started off OK, but went all over the place quickly and went into blackcurrant madness and lost all balance, sadly. The 2004 Castel C was DOA, not fun at all. In the end, the first night was ruled by the epic 2007 Hagafen Late disgorged Brut and the 2007 Ella Valley Cabernet Sauvignon, Vineyard Choice. After that, it was off to bed, as we had a long day ahead. I woke up pretty much on time the next day, and we were off to see a wine store in the area, where I picked up a few bottles for the next few nights festivities and then it was back to the house to enjoy bubbly and some insane meat along with two wicked red wines; the 2005 Yatir Cabernet Sauvignon and the 2003 Malartic Lagraviere, Pessac-Leognan. Both were insane, but the Malartic is an entirely different world wine, with filthy layers of fruit, tannin, and barnyard – madness!!! 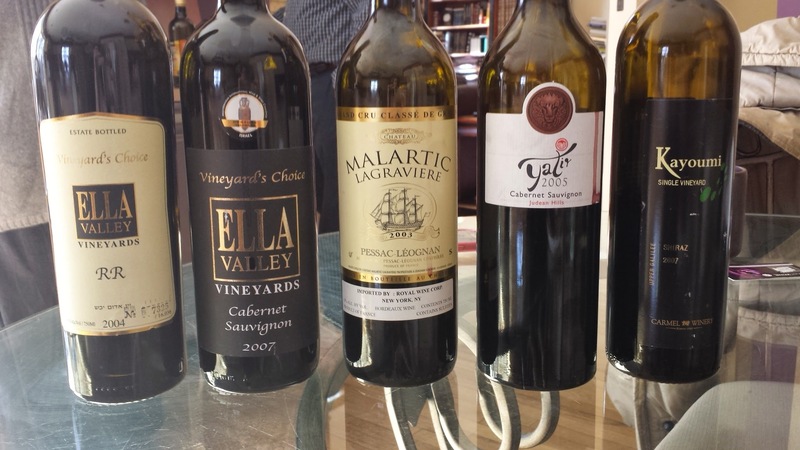 Still, the 2005 Yatir Cabernet (their first varietal cab) was really impressive and had no flaws. The next day I jumped on a bus and made my way to Brooklyn where I hung out with friends of ours, and for dinner I made my way to YC’s house, where a crazy dinner was being setup. By the time I arrived, YC and YB were going mano-a-mano, side by side, with varying types beef tartare, and rib roasts, while YB handled the burgers exclusively. Humorously, looking back at the dinner it really turned out to be an entire night of uncooked fish and beef tartare – really! When I arrived I was famished so we ordered in a LOT of Sushi for the guests who were already arriving, while the two cavemen “prepared” the meat, there really was no cooking going on here! Once we had inhaled the sushi (or most of it) and were accepting of a time-out, I ripped through a few of the white and bubbly wines described below, for note purposes only (they were not that enjoyable) and then we were ready for the serious food, cooked or not! On a total aside, the sushi came from an establishment called Five day sushi! Now, I am not into marketing, seriously, but who the heck came up with that name?? Do you think anyone who looks at that name, would care that fish were created on the fifth day of creation?? NOT ME!! All people looking at that name, for the most part, will think they sell sushi that is five days old, how safe or appetizing do they think that sounds?? With that said, the sushi was great, albeit the horrific name. The meat evening started with two courses – one made each by YC and YB – of beef tartare, YC’s was more Dijon mustardy and spice, while YB’s had smoked tongue rilletes, oil, and lots of herb – if I remember correctly. From there they went to rib eye two ways, which was essentially raw meat with a slight sear – LOL!!! Actually, YB brought this sick looking chunk of meat and that went on the girl for about 30 seconds, maybe a drop more! The inside was still moving and blue while the outside was well seared, as I said raw meat night! Next, there were burgers, of which I cannot remember, but again it was well seared raw beef patties, really beef tartare but in a ufo shape! Finally, YC brought out a huge chunk of rib eye meat (AKA roast) and I grabbed the bone, and finally there was actual cooked meat! However, to be honest, by then I was cooked, I was not spitting much and the raw meat was fermenting in my stomach and I was out for the count.